A polynomial isn't as complicated as it sounds, because it's just an algebraic expression with several terms. Usually, polynomials have more than one term, and each term can be a variable, a number or some combination of variables and numbers. Some people use polynomials in their heads every day without realizing it, while others do it more consciously. Many algebraic expressions are polynomials, but not all of them. While a polynomial can include constants such as 3, -4 or 1/2, variables, which are often denoted by letters, and exponents, there are two things polynomials can't include. The first is division by a variable, so an expression that contains a term like 7/y is not a polynomial. The second forbidden element is a negative exponent because it amounts to division by a variable. 7y-2 = 7/y2. You've probably used a polynomial in your head more than once when shopping. For example, you might want to know how much three pounds of flour, two dozen eggs and three quarts of milk cost. Before you check the prices, construct a simple polynomial, letting "f" denote the price of flour, "e" denote the price of a dozen eggs and "m" the price of a quart of milk. It looks like this: 3f + 2e + 3m. This basic algebraic expression is now ready for you to input prices. If flour costs $4.49, eggs cost $3.59 a dozen and milk costs $1.79 a quart, you will be charged 3(4.49) + 2(3.59) + 3(1.79) = $26.02 at checkout, plus tax. Among career professionals, the ones most likely to use polynomials on a daily basis are those who need to make complex calculations. For example, an engineer designing a roller coaster would use polynomials to model the curves, while a civil engineer would use polynomials to design roads, buildings and other structures. Polynomials are also an essential tool in describing and predicting traffic patterns so appropriate traffic control measures, such as traffic lights, can be implemented. Economists use polynomials to model economic growth patterns, and medical researchers use them to describe the behavior of bacterial colonies. Even a taxi driver can benefit from the use of polynomials. Suppose a driver wants to know how many miles he has to drive to earn $100. If the meter charges the customer a rate of $1.50 a mile and the driver gets half of that, this can be written in polynomial form as 1/2 ($1.50)x. 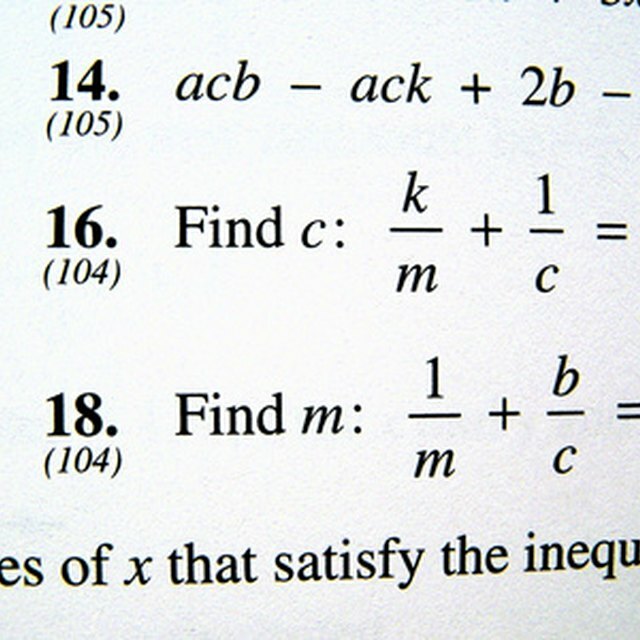 Allowing this polynomial to equal $100 and solving for x produces the answer: 133.33 miles. Polynomials are easier to work with if you express them in their simplest form. You can add, subtract and multiply terms in a polynomial just as you do numbers, but with one caveat: You can only add and subtract like terms. For example: x2 + 3x2 = 4x2, but x + x2 cannot be written in a simpler form. When you multiply a term in brackets, such as (x + y +1) by a term outside the brackets, you multiply all terms in the bracket by the external one. y2 (x +y + 1) = xy2 + y3 + y2. If both terms are in brackets, you multiply each term inside the first bracket by each term in the second. Deziel, Chris. "Everyday Use of Polynomials." Sciencing, https://sciencing.com/everyday-use-polynomials-6319219.html. 13 March 2018.